In this Tutorial you will learn to build an Android app with a connection to Facebook . 2. If you haven‘t created an app yet, you will be asked to give your first app a name and to give a short description. In our example the app is called “Facebook”. For your app, however, you should use a unique name. 3. Now you see the Apiomat Dashbaord. You start on the Module Market with all the available modules you can add to your app. Scroll down and select the Facebook Module and click "+" to add the module. 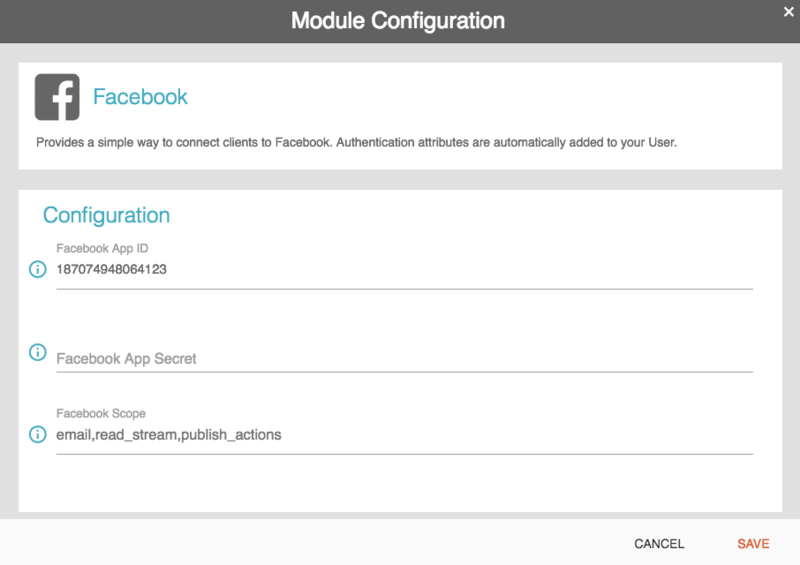 4.After clicking the plus, ApiOmat will ask you to configure your Facebook Module. Here you can enter your Facebook App ID and secret password, but you can leave those blank for now. In the field "Facebook Scope", add “publish_actions”, this will, among other things, allow you to post on your wall. Once you done that, click on “Save”. 5. Now we have to deploy our backend, to do this, click on the slider next to "INACTIVE". 7. Download the Android SDK and you will download a .ZIP file that contains all classes and resources you need. Unpack the .ZIP file, saving it somewhere on your hard disk. 8. Open your IDE (e.g. Android Studio) and set up a new Android project. 9. Open the folder where you unpacked the Android SDK .ZIP file. 10. Copy both folders into the “src” folder (source) of your app. Now we can get started on the frontend! First, let's set up a basic layout. 1. Open the layout file of your Main Activity. You can find it in the folder “layout” within the folder “res” (resources). The XML file has the same name that you gave your Main Activity. 2. The Android SDK sets up a RelativeLayout by default, which is somewhat cumbersome. So delete the code and create our own LinearLayout. 3. 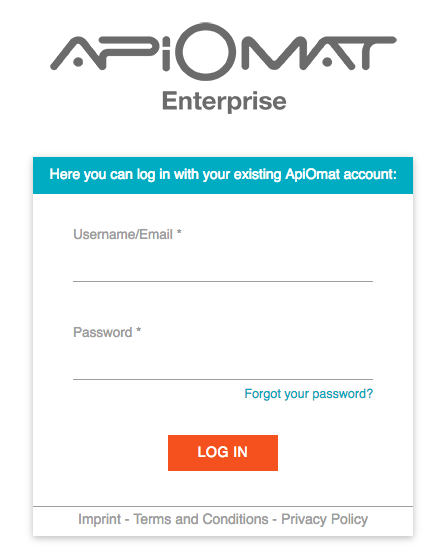 Add a button called “log in” that contains a listener for the method “login”. Make sure that buttons, text strings, etc. are children elements of the LinearLayout. Usually all strings in Android are stored in an extra file (strings.xml in the folder “values”), but leave them here for simplicity's sake. 4. Below the button, add an input field- or as Android calls it- EditText, and give it an ID. You will use the ID later. 5. Let's create a second button, labeled "Post text!" and trigger the method "post". 6. Finally, insert a WebView. This allows you to view websites in the app. You will use this to log in to Facebook. The packagename which the Activity belongs to. The class that‘s named after the Activity and the methods “onCreate” and “onCreateOptionsMenu”. 2. Delete the “onCreateOptionsMenu” method. This method causes a menu button to be displayed in the upper right corner of your app. As we don‘t want to set up a menu, it‘s a so called “menu button of shame” without any functionality. Change the username and password to what you would like it to be. When you're finished with this step, the connection to the backend is initiated. 5. With the next code block the user is being forwarded to the server. It will check to see if the user with this given user name already exists. If that's not the case, it will create a new user. You have the option to choose between MemberID and UserUserName. 4. The last action of our Login method is to open the Authentication URL with the WebView. Note: you will have to replace NAMEOFYOURAPP with your app's backend name. 1. Now that you can log in, move on to create a new post for your wall. 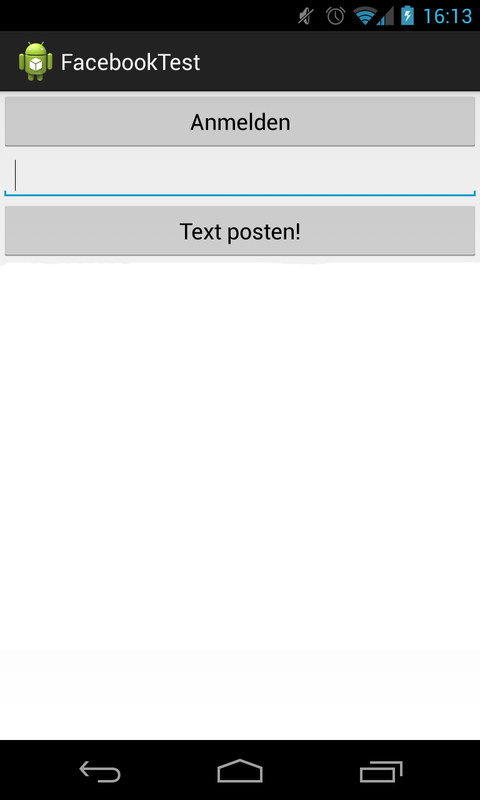 Let's generate the method “post”, which posts the text entered into the text field. 2. First, generate an object of FBUser. FBUser represents your Facebook account. 3. Now you need to save the User, so that a valid href attribute can be received. To prevent potential mistakes, surround the Codeblock with a try-catch statement. 4. To create a post, you have to first create an object of the FBPost class that will represent your post. One could also say you‘re generating a new post. 6. Now set the string “posttext” as the content of your post. 7. To publish the post you just save the newPost. An Android app is not allowed to do anything by default. So to access the internet, you need to ask for permission. You can do this in the Android Manifest. 1. Open the AndroidManifest.xml in your app's root folder. Now your frontend is installed! 1. Start the app on your Android smartphone or in an Android emulator. 2. Tap the "Log In" button. The browser should open and you will be asked to enter your Facebook data, as the ApiOmat-Facebook-App requests authorization. 3. Log in with your Facebook data and press install. Now you're connected to Facebook. 4. Press your smartphone‘s back button until you’re back on the screen of the Android app. 5. Enter what you would like to post to Facebook into the text field below, for example “ApiOmat is awesome!” and then press the button “Post text!”. If you check out your Facebook page now, you will find the text you entered posted onto your Facebook wall!